Markets ended the week mixed, showing an upward trend after the previous week's losses, but still subject to investor nerves. For the week, the S&P 500 gained 0.46%, the Dow lost 0.47%, and the Nasdaq gained 1.53%. 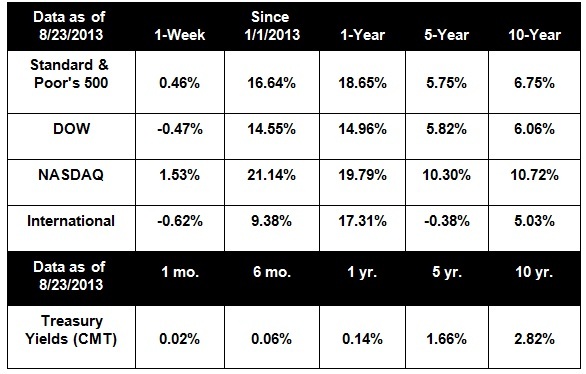 Uncertainty around the Fed's tapering schedule drove much of market activity last week. While many Fed speakers have suggested that tapering may begin after the September FOMC meeting, they have cautioned that the Fed's plans remain data dependent. Mixed housing data, unconvincing jobs growth, and low inflation may argue for a delay in tapering, but policy direction is under heavy debate within the Fed and it's hard to know which date the Fed will choose. What we do know, based on FOMC minutes and Fed speeches, is that unwinding will be gradual and policy changes will be slow, giving markets time to adapt to the new environment. As the days tick down to the September 17 FOMC meeting, we can expect additional market volatility. However, investors have had significant time to digest the eventual end of quantitative easing, and we can hope that any negative market reactions will be short-lived. On the jobs front, though weekly claims edged upward, the fewest workers in five years applied for unemployment benefits for the month ending August 17, indicating that the labor market slowly continues to improve. However, regional data shows a mixed picture, with the jobless rate still climbing in 28 states and major employers announcing job cuts. Fed watchers have indicated that the August jobs report will be a major factor in any decisions made at the September FOMC meeting. A technical glitch caused the Nasdaq to shut down for three hours on Thursday, halting trading in thousands of stocks. The shutdown was the longest in recent history, and exchange officials are investigating the origins of the technical fault. Despite rattled trading desks, investors shrugged off the shutdown and the Nasdaq still closed up for the week. Looking at the week ahead, investors will be closely watching the release of important housing, consumer, and manufacturing reports as well as additional speeches by the St. Louis Fed President James Bullard. Fed watchers will also be analyzing several reports as they wait for the much-anticipated August jobs report, which will be released on September 6. The jobs plentiful/jobs hard-to-get component of Tuesday's consumer confidence report and the employment component of the Chicago PMI will hopefully give clues about general job trends this month.